thinkcybis | We love OUR WORK And it SHOWS. How many times have you read a job posting and thought to yourself ‘I’ve done that’ or ‘ I can do that’… ? Confidence and assertiveness can be a powerful thing when facing your potential employer, but like everything, you have to get there first. So, you found the job you want and all you need to do is get that interview so you can flash your charming smile and show what you can do to the head honcho (or CEO)…. but you have to get through the bodyguards (or HR department) with a well written cover letter, photo (if requested) and brief but concise resume. If you have a theme for your resume or even a self branded logo, use it from the beginning. Use a clean and easy to read layout for your cover letter since you should have enough writing about why you are applying (not too much and not too little). The most appealing is a two paragraph read. It looks organized and it also provides a break to the eye. A big block of writing spanning an entire page is daunting and can cause the viewer to quickly discard it. Do not use comic sans! Your entire presentation is over with this one. This is a brief summary of who you are professionally and how you can apply your past experience to the job. DO NOT write your life’s story, keep it to the point. Know the company you are applying for! It’s Cybis, not Cybus!! You will immediately be discarded if you don’t even know how to spell the name of the company. You REALLY stand out if you mention work you have viewed of the company, either in person or through doing research. It’s not creepy, it shows you know your stuff! Make sure you sell yourself for the position, but don’t come across as arrogant! This is the first glance at your personality, so be creative in your writing while still staying on the subject. Scenario: If you want to write a funny story about a tractor you fell off of one time to show your humorous storytelling personality, make sure you tie it in with the job, so in this case maybe how that inspired a movie you directed that you won an award for. Avoid the usual, doesn’t easily show off your personality on paper. If you submit or include a photo as part of your resume: This can make or break whether you get to the boss for review even if you have a good cover letter; a picture speaks a thousand words so keep it professional! DON’T send a picture wearing a t-shirt that has a weed symbol on it (or any drug or weapon paraphernalia)! DON’T send a photo of just your dog… no matter how cute he is… he isn’t you! DON’T send a group photo of you and your buddies or girlfriends, it makes it hard to figure who you are! DO get creative and make it applicable to the type of company. As mentioned for the cover letter, be consistent with a theme or self branded logo. Do not use comic sans! Ever! Make your layout easy to read and make it so that they eye carries throughout so that not a single skill or ability is missed. Make it one page! 2 pages max but in most cases is not necessary. All your necessary talents are best presented on one page. Start with what’s most applicable. Ex. if you have work experience for the job you are applying for but not the degree related to the field, place your work experience at the top. Make sure you’re describing how you evolved, saved money or improved the company you work(ed) for. Prove you are an asset! List the dates you worked at each place, it is not a resume if it doesn’t include dates! What I’m trying to say is that it’s not easy, but certainly, it’s not impossible. You need to Build your portfolio and résumé to resemble someone worth taking the time to train. It is rare that an intern can impress a skilled professional, so don’t rely on your current skill and knowledge alone. Also, become interested in the companies you are looking to work with and don’t just be another email in their inbox. I almost lost my chance to be where I am today by giving up on my search. I was fortunate that Cybis was willing to train someone with little industry knowledge and actually took the time to contact me. This is extremely rare and unlikely to happen, so I would encourage you to never stop giving it your all. If you feel lost then I suggest finding someone in the industry and asking them what you should improve and work on. While the start is always the most difficult that doesn’t mean the internship process is a free ride. Prepare yourself to learn and remember to ask questions whenever you need help. At the end of the day you are there to learn about the industry and the company itself. You should not be spending an hour figuring something out on your own when someone is able to show you how to do it in 10 minutes. Remember though that not every employee at a company will be friendly or helpful. It is important that you find people you identify with and create a friendship with them. This will not only help you during your internship but also after the internship is complete, and plus, you made a friend! It is also important to spend time researching on your own outside of work. It can be incredibly impressive when an intern is able to bring a new skill to the table or even improve upon what is already done. The more time you are able to spend researching during your internship the better off you will be. And you’re done! Well, not really, but we can pretend for just this line. Finishing the internship only matters if you make it matter. Do not assume that you are guaranteed a position within the company. Work hard and stay connected with the people you have been working with. Be open with those you created close friendships with and directly ask them about employment. You can either be assured and pat yourself on the back for working hard, or you can find out about what you need to improve so you can land a job in the future. To wrap this all up, this is a highly summarized talk on the during, before, and after an internship is completed. There is a lot more to learn and be prepared to make mistakes. If you are able to absorb all that was talked about here then you will be a lot better off. It’s much more competitive now than it ever has been in the past. However, be assured that there is a possibility out there for you. It will just take some extra work to get there. So you’re a recent college graduate equipped with an awesome cover letter, top notch grade point average and raving reviews from administrators & peers alike. In the work field, possessing all of the aforementioned qualities is fine but without real hands on experience you will placed in the bottom of the pecking order in the eyes of employers whom are engaged in the process of hiring new employees to add to their companies. Graduates whose résumé feature paid or unpaid internships have a higher chance at landing a full-time position shortly after graduation. 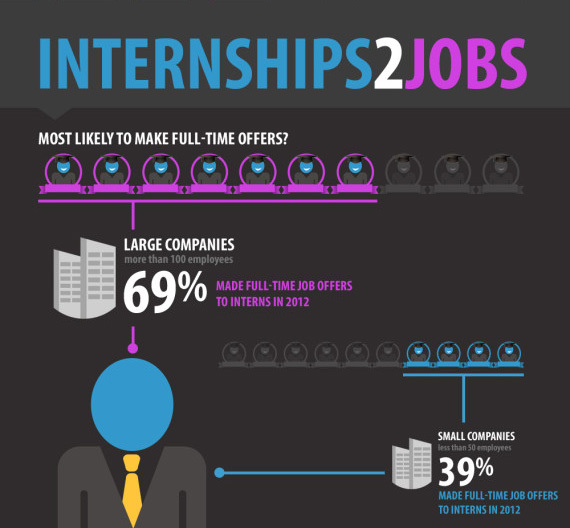 Most students are taking advantage of internships while pursuing undergraduate degrees, and it is not unusual for recent grads to take an unpaid internship with the prospects in mind that it will turn into a permanent position or at the very least make some industry related contacts while continuing to build their résumé. The current depressive state of the economy is changing the nature and increasing the importance of the work given to interns. Employers happen to be using the interns as a fundamental resource to solidify areas where full-time hiring has been cut. Job applicants usually put their best foot forward on paper. Their cover letter and résumé usually been screened by many eyes to ensure quality and appeal while remaining professional as possible, and nearly every employment seeker chooses references who will speak well of them. While an interview or an assessment test can add to what an employer knows about an individual, an internship helps an employer evaluate how a person would fare in the actual workplace. Companies that devote time and resources to finding, selecting and training interns are looking for a return on their investment. The benefit might be in the present (using the services of talented individuals without having to make a hiring commitment), or it might be in the future (the added ability to choose a person who will work out well as an employee). 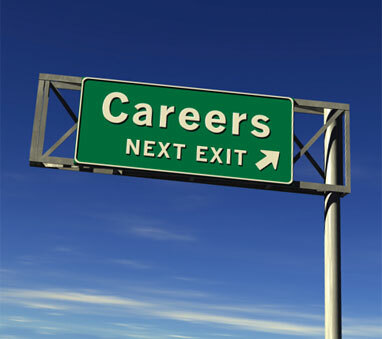 Most high schools, colleges, and universities possess career centers where you can search for an internship. Often times, these centers will be staffed with employees who can aid you in your search, offer you advice, and assist you with writing your resume and cover letters. Job fairs held in cities are often great places to seek internship opportunities. At these events, companies seeking to hire employees or interns will have booths where you can apply or get more information. Look for job fairs in your area and be ready to attend. 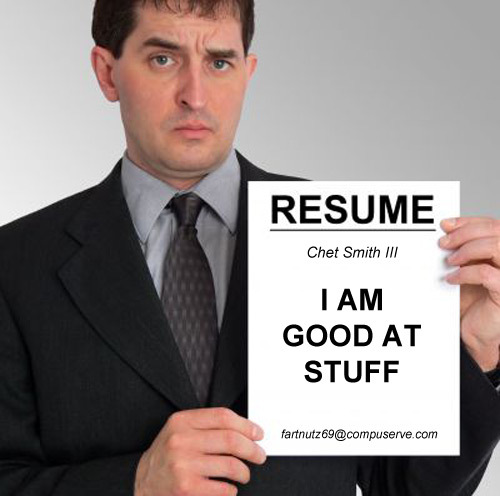 You should have a strong idea of what you’re looking for, as well as proper dress and a resume. Many career fields will have professional organizations, associations or regional branches of those groups. These will often have online job postings or postings in their offices. 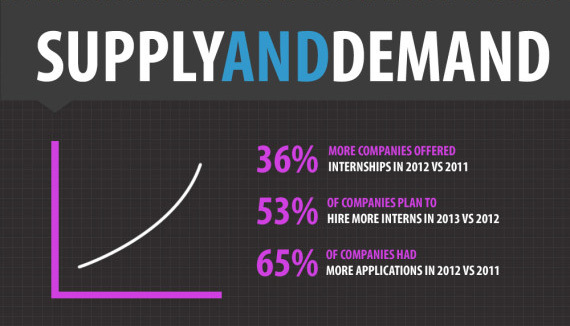 Call the organization appropriate for your field and ask if they provide any information regarding internship openings. Networking is one of the best ways to find internships and other work opportunities. Poll your friends using social media, ask your parents or your parents friends, or talk with acquaintances and employers about openings they are aware of or people they may know who would be open to taking an intern. There are many websites which are designed to help people get internships. While you have to be careful, since like other job websites there are often people wanting to scam you, these websites can be invaluable tools for finding internships you might not have been aware of otherwise. Before becoming a part of Team Cybis, I had spent the majority of my professional and higher educational life within the world of theatre. One of the things I really enjoy about working at Cybis is the chance to bring my theatrical experience into the world of corporate theatre and our extension of that: Total Creative Communication. These worlds share a number of similarities and a number of specific nuances that really do separate the experience of working within each discipline. For this first blog, in a potential series, I wanted to talk about some of the similarities I’ve noticed early on in my tenure and some tips that the world of theatre provides for us to make Cybis events successful! Who is the most important person in theatre? Regardless of the age, I would usually get the same first few responses; Director, Lead Actor, Lead Actress, the person who pays you (the Producer). Then some of the more attuned students, remembering what I had told them about my experience, would answer the Technical Director or the Lighting Designer. While I appreciate the grab at brownie points, the answer still isn’t right. Here’s their clue: It’s the only person or person(s) required for any art to be successful; dance, drama, opera, sculpture, digital, corporate… any art requires it. Look at the first picture. The most important person isn’t in there. Despite my technical background and position at Cybis, it’s not the techs. It’s not any of the designers, the directors, or even the producers. Without an audience, a production team is just rehearsing, an actor is just talking, a dancer is just moving, and a graphics designer is just clicking, dragging and typing. When someone views our creation, our creation becomes art and is subjectively and objectively viewed and responded to. The audience is the sole reason art exists. Without it any creation is essentially a glorified diary entry – a way to express one’s ideas, desires or reflections of their experiences and observations. It’s a key component to understand when going into any artistic endeavor. I can imagine that those of you who really key in on that adjective: corporate, might be asking yourself, “What about the client?” Well it is true that the client is very important in our line of work. Without the client, we wouldn’t have a contract, without a contract we wouldn’t have revenue, without revenue I’d be either volunteering or working elsewhere and the business wouldn’t survive. Clearly, the client is important. In terms of theatre this person, this entity – the client, doesn’t directly exist. We would call the person ultimately calling the shots and signing the checks the Producer. Producers make the business happen. Producers are why we go into theatre as an industry. But it’s not why the theatre exists. 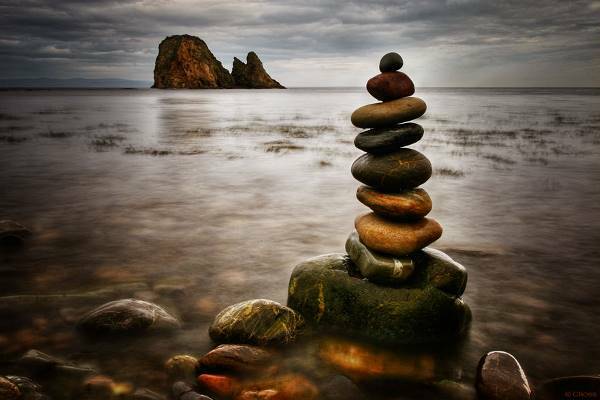 Ultimately, the producer – the client, caters to some higher authority. They speak through buying tickets, sharing reviews and especially in corporate theatre; continuing, starting or increasing their support of your brand. It all comes back to the audience! Understanding the importance of the audience is integral to every decision. Our Total Creative Communication focuses not only on what the client asks for, but why the client is asking for it. How does it impact the audience? What is the audience flow into the room? What do they see? Will our really cool graphics on the computer at HQ read to a live audience? Are we broadcasting to another audience? Those are the easy questions to consider. The answers can be simple or they can be complex but ultimately the question itself is very basic and conceptual minds can sort out the answer. But the effect of the audience should be more impactful than even these major concepts. The audience needs to always be the focus during installation, rehearsals and the show itself. Let’s take our rehearsal process. I’ll delve more into the rehearsal timeline and process differences between traditional and corporate theatre; because they are massive! Typically Team Cybis rehearses 1-2 days before its show time. (Theatre friends, I know! I told you, I’ll get into that in the future.) In that period of time there is troubleshooting, rehearsing difficult parts of the show, getting familiar with the intricacies of this particular script, for this particular session, for this particular client, and integrating all of the individual components: speakers, keynotes, lighting, sound, scenic, stage management, video, cameras, etc. Under optimal circumstances it’s a lot to do in a short period of time. Now let’s say something isn’t going right. Maybe the switcher is having a hard time getting through a tough section in the script. Maybe the sound board operator doesn’t feel comfortable with a transition, but they can still hit their cues. Maybe the lighting designer wants to run a section over again to tweak the focus on one of their moving lights. 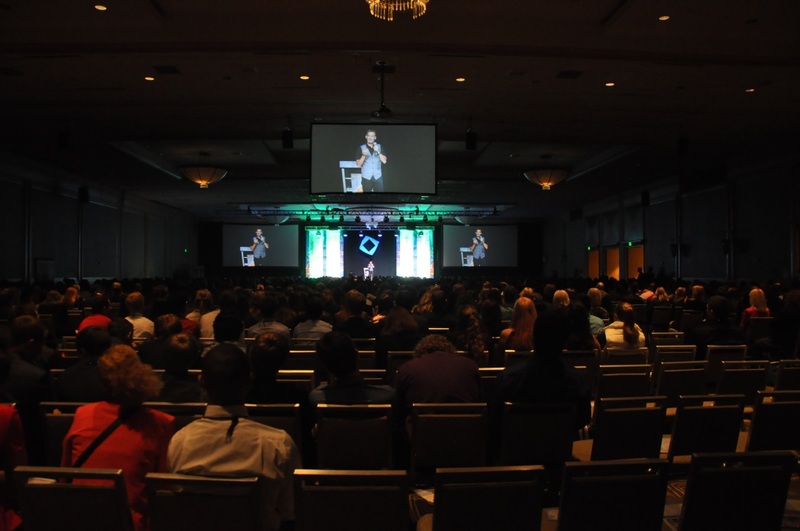 All three people will tell the director that they need the stage or a few minutes, but the director needs to follow the schedule and get a full opening session rehearsal in before the keynote speaker arrives in 45 minutes. How do we proceed? We remember that the audience is the most important person. We prioritize our efforts towards those things that most impact the audience. Obviously if any of these things impacted safety, it becomes priority number one! In our situation, nothing will directly impact safety… Now put yourself into the director’s chair: What would you do? Our directors know how long a session will take to go through. Let’s say it takes 35 minutes. That leaves 10 minutes to make changes and check those changes before the keynote rehearsal begins. Ten minutes isn’t that much time. It just took you 10% of that time to re-read the paragraph above and another 10% to get to this point. Time’s wasting! If the switcher misses cues, the audience will notice if the graphics and script don’t match. Let’s work through that section. 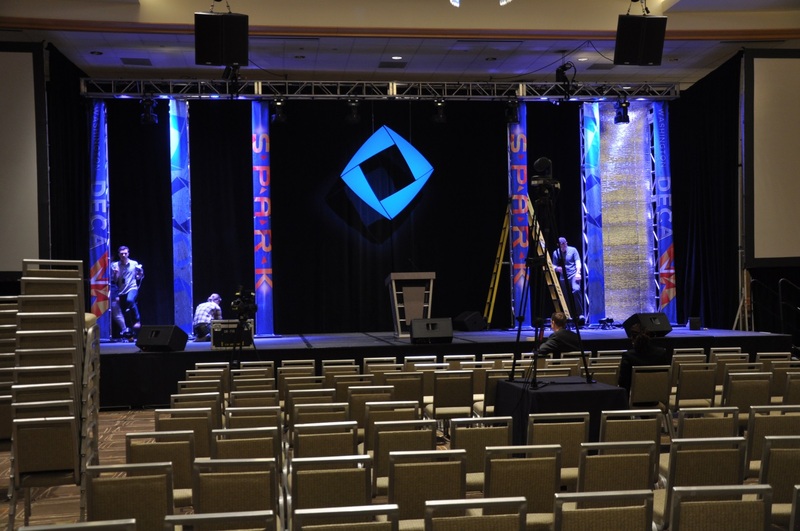 Let’s also have the Stage Manager meet the keynote speaker to help them get setup when they arrive so we can go right into their rehearsal when they are ready. When video is resetting, lighting and audio can work their sections. After a few runs of the rough switching section, let’s put it all together and run the problem section for the switcher. Time to rehearse with the keynote! Now let’s go back to what used to be the rough section, check our progress, find out we got it, save our work and… break for lunch! Remembering that the impact to the audience is the number one concern, we know we need to get the switcher right. If audio can hit their cues, they aren’t a priority. And if lighting is just cleaning up a look or series of looks, even if the change is slight, the impact to the eyes of the audience may be significant. Get the switcher right, then lighting, then audio in our scenario. To the audience, the show will be optimal and the event memorable. A happy audience! Just what the client wanted. Imagine you’re a designer and you’ve been tasked with designing the newest and coolest flyer for a large event. They tell you the information they want, and a general concept for the design and you put your creativity to work making the coolest thing you’ve ever produced. Your friends/co-workers walk by and remark about how awesome it is, making you feel super confident. Four hours later you cheerfully and optimistically present what might be your best work ever to your (client) boss. Their response: “This is garbage. It took you four hours to come up with this!? It feels.. so.. amateur.” Of course then you try to explain your vision and concept, but they’re not convinced. If you’re lucky they’ll explain what you can change and let you take another shot at it. If not, they’ll hover over your shoulder and literally tell you what to change step-by-step. 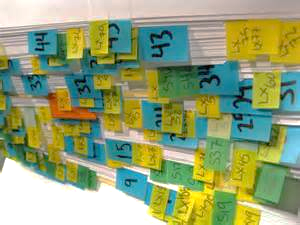 I call this “Design Hell”. Now, in a moment like this, especially if this isn’t the first time this has happened, it’s easy to lose your temper. There is nothing worse than having your design/pride ripped apart and then being reduced from designer to a voice activated tool for your boss’s design. What’s worse is when what they’re forcing you to make is hideous. So you now have two options: Explode, tell them off, and quit. Or, you can take an internal step back, get your emotions in check, take a deep breath and remember it’s not about you, it’s about the client. As freelance or full-time artists, you made a commitment to make art for your client or your company (which essentially makes your boss, you main client.) This is a different concept than making art for yourself, and one that often involves separating yourself emotionally and getting your pride taken down a notch or two. What you have to remember is that if you’re answering to your boss, they are answering to theirs, who may very well be the client directly. Regardless of their communication ability with you, they have a picture of what they want in their head, and it’s probably based on information you may not have been given. Maybe it’s past experience, maybe it’s a meeting you weren’t privy to and maybe you weren’t given enough of the big picture to get it. But the point is, for them, it is not personal. So if you take it personally and explode, or even allow it to simmer under the surface, the only person you’re hurting is yourself. When you allow resentment to screw up your attitude, not only will you lower your own motivation and performance, but you’ll make yourself seem less professional to you boss/clients which can very quickly affect your livelihood. As the holiday is fast approaching, there are several organizations that are in need of assistance. What is near and dear to your heart? A good place to start is Volunteer Match.org. http://www.volunteermatch.org/?l=Orlando%2C+FL#. They match your skills and abilities to organizations that need your help. Also http://www.handsonorlando.com is a local Orlando volunteer site. Here are a few organizations I have volunteered with that may not be listed on the above sites. Ronald McDonald House (https://www.ronaldmcdonaldhouseorlando.org) needs volunteers to do various positions such as signing people in at the front desk. The most fun I’ve had there is pulling together 5 or 6 people to cook for the guests. Schedule to serve a Lunch or Dinner at either House (near Arnold Palmer or FL Hospital Princeton). Gather donations, make a menu, purchase groceries (usually $200-300), and cook at the House. Keep it simple and easy such as Chili over rice, salad, bread and dessert or Rotisserie Chicken, salad, vegetable and dessert. All the dishes, pots and pans, and utensils are there. The average number of persons for lunch is 10-20 people and dinner is 20-40. Anyone want to put a group together let me know! Also if you have pocket change, donating trial size personal items such as deodorant, shampoo/conditioner, soap, shaving cream, etc is always appreciated. Kids Against Hunger (http://kidsagainsthunger.org) is a National organization that packages food to feed hungry families. Yes, Danny they even have locations in Minnesota!! They host packaging events to make the highly nutritious, vitamin-fortified soy-rice casserole food packages to hand out. Each package feeds 4 people when you add water. One thing I like about this organization is they help in a couple of different areas. Whenever a disaster hits an area of the world, such as a tsunami or earthquake, they ship food there. However, at least 50-60% stays here in the US to feed homeless families. You can donate money but they also need people in 1 hour shifts to help at the packaging events. Ok so holiday gifts for friends and relatives have already tapped out your wallet. How about donating time? Several organizations are happy to let you volunteer a few hours whenever you have them to spare. Habitat for Humanity is always looking for someone to swing a hammer or put finishing touches inside a house. They list their builds a week in advance. http://habitat-orlando.volunteerhub.com/events/index. They also need volunteers daily at their ReStore Shops (N. OBT, E. Colonial and FL Mall) to help sort and organize donations. Maybe put those brainiac skills to work and tutor a child in Math, Reading or Science. As little as 4 hours a month could help a child learn and possibly set them on the path of success. The Neighborhood Improvement Corporation does require a driver’s license and background check. You can reach ONIC at (407) 648-1623. As some of you know may know, Cybis has a matching donation program. Cybis will match any qualifying donation over $25 and up to $100 annually per employee to eligible organizations. So what are those eligible organizations? They must be listed as a 501(c)(3) organization. All of the ones listed here qualify. Also many of the more well-known organizations such as March of Dimes, Red Cross, America’s Second Harvest, American Cancer Society and ASPCA qualify. (Usually alumni and religious associates do not qualify.) Please double check with me and I’ll be happy to help. Don’t forget volunteer opportunities are available all year long…so reach out and help someone in need. You will be surprised what you will learn and how much helping someone else will enrich your own life. Want to work harder and get more done? Then STOP READING! But if you’re like me and think you work as hard as you can, yet still want to make a bigger difference, let’s hang for a moment. I’m trying something new and you can join me. First, let me say I’ve spent the past decade becoming “more efficient.” I get LOTS of stuff done and I’m pretty darn quick. In my last blog (link here please!) I talked about making quick decisions. That in itself has made me more productive. But… Team CYBIS expanded its vision and it’s time for me to expand my mind. We aim to be a world-class leader in creative communications. That means we seriously want to make a BIG DIFFERENCE. We want to contribute more and inspire more. But as CEO, I’m BUSY! How can we achieve more if we’re already tapped out, exhausted, and simply out of hours in the day? The answer requires us to first recognize what most “knowledge workers” do during their day. We spend 70% of our work time with urgencies and irrelevancies, and only 30% of our time on important priorities. We’re spinning our wheels. And typically by the time we finish that 70%, we’re probably not even that focused and effective with the important stuff leftover. I often convince myself that “after I finish all of this” I will be able to focus on “this big important thing.” But the truth is that I will never be done with the influx, which means unless I change my approach, I’ll never be able to contribute to the things that matter most. 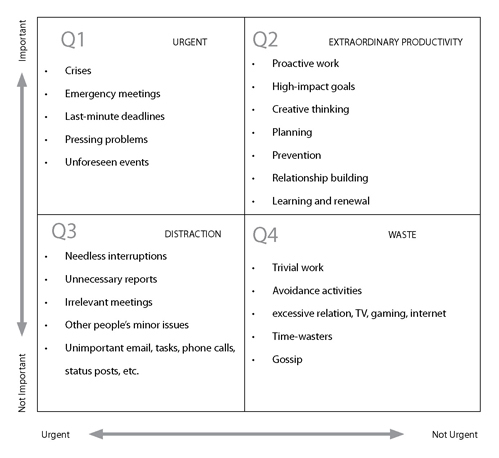 Per the Time Matrix, we how we spend our time falls into one of 4 quadrants. Notice the important activities in Q1 and Q2. And the urgent activities in Q1 and Q3. Q4 is neither important nor urgent and therefore a waste of time (social media updates, drowning yourself in TV and mindless Internet searches). Unfortunately, most of us spend a quarter of our time with crises and last minute urgencies (Q1). These are important items that we must tend to right away. However, the case can be made that with better planning, proactivity, and strategy, (ahem, Q2), we can greatly reduce the number of “emergencies.” Therefore, the more time you put into Q2, the less time you’ll even need to be in Q1. Physiologically, Q1 activities give us a dopamine hit and the rush and excitement gives us a temporary high; even a feeling of superhero status. That’s why it’s addictive and must be consciously minimized. Then, we spend a quarter of our time with interruptions and distractions that seem really important. By the time we finish our day, we’re exhausted because we think we’ve done so much. And the tricky part is that we actually have an adrenaline rush from the stress, thereby deluding ourselves into believing we were “productive.” Unfortunately, reacting to the urgent is like a mouse in a spinning wheel. There is no end to these things. And the faster we do them, the more there seem to be! These endless activities are confused with accomplishment but they’re not helping anybody make a big difference. Q3 people are urgency addicts. So join me in a life focused on the important (but not urgent things) and tell me if you feel a greater sense of peace, control, and fulfillment. I think this is one technique to help us really make a bigger impact on the people and world around us, and ultimately live extraordinary lives. Source: Mostly hijacked from The 5 Choices of Extraordinary Productivity (www.the5choices.com). I highly recommend the book for busy professionals.